More recently, Tiga has been gracious enough to lend his wind-shattering vocals to Richard X’s “You (Better Let Me Love YouX4) Tonight,” as well as “Heartbreak/Ananda,” by Beyer & Lenk (Adam Beyer and Jesper Dahlback), and Rik Stamina’s “Dancing Inside You.” His remix work on Alex Kidd’s “Come With Me”, Neon Judgement’s “TV Treated,” Scissor Sisters’ cover of Pink Floyd’s “Comfortably Numb,” “Da Hype,” by Junior Jack and Robert Smith, and Peaches’ “Shake Yer Dix,” and Soulwax’s “E Talking” comprises a merciless Crimson Romance, lapping at the shores of eternity. 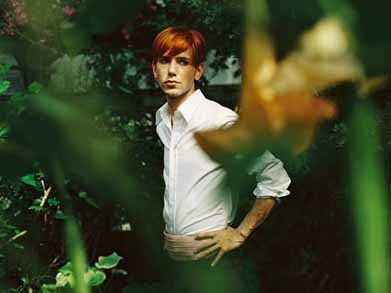 Tiga’s smash single, “Pleasure From The Bass,” a two-fisted jackal that drew a line in the dancefloor sand, was released in 2004 on the Belgian imprint PIAS, and left scores of club DJs desperate to pack Tiga’s musical foxhole. 2005 saw mixes for Depeche Mode, The Vests, Moby, LCD Soundsystem, Mylo, Philippe Zdar, Chelonius Jones, Drama Society, Thomas Andersson and hundreds of others. “You Gonna Want Me”, the smash duet with jake Shears of Scissor Sisters fame is set to set the earth on fire in October……clearing the way for…. Sexor, his full-length album of original material, is due early 2006, and will sound the clarion call of an emergent Nation-Man. Tiga: "I’ve just got my hands on Ableton Live 5.0 and just got a Protools LE setup for my home studio. Both are brilliant. Tiga: "I really liked Australia  I mean I think it doesn’t feel that different to Canada. There are a lot of similarities with one striking difference  you guys got the weather. It’s like, it transforms everything else and everyone’s in a good mood to party - kinda like here in summer I guess. I don’t really think there’s too big a difference, culturally. You know? I mean, Australia  it’s not like it’s a big culture shock for me." Tiga: "If I were purist I’d still be listening to the Hank Williams records I bought when I was 8 years old  such a big gap between people who make music and people who talk about it and people who are actively working on music... well, you borrow from different things at different times and it comes out different all the time. Sometimes it fits neatly into a label and you move onto the next thing. I mean, I have nothing against the whole ‘ElectroClash’ thing - it benefited me and I considered myself a part of the whole"